We’d love your help. Let us know what’s wrong with this preview of Unlocking the Clubhouse by Jane Margolis. The information technology revolution is transforming almost every aspect of society, but girls and women are largely out of the loop. Although women surf the Web in equal numbers to men and make a majority of online purchases, few are involved in the design and creation of new technology. It is most Understanding and overcoming the gender gap in computer science education. To ask other readers questions about Unlocking the Clubhouse, please sign up. First thing that strikes me is the age of the research - all conducted in the late 90's. Has anything significantly changed in the intervening 15 years? Part of me hopes to discount a fraction of this, knowing that many of these trends and influences persist; the cynic in me worries that *nothing* has changed, and in fact may have gotten worse with the brogrammer culture we hear so much about in Silicon Valley and similar high-tech concentrations. Second thing is how narrow the study population w First thing that strikes me is the age of the research - all conducted in the late 90's. Has anything significantly changed in the intervening 15 years? Part of me hopes to discount a fraction of this, knowing that many of these trends and influences persist; the cynic in me worries that *nothing* has changed, and in fact may have gotten worse with the brogrammer culture we hear so much about in Silicon Valley and similar high-tech concentrations. Second thing is how narrow the study population was - all undergraduate students (mostly comp sci majors, some not). It's understandable - a lot of social-studies academic research draws on the handy and willing population of students local to the researchers - but that still means that there's a lot of room for improper extrapolation. "The pipeline is leaking all the way"
"The computer in the boys' bedroom"
"Boys and computers: the magnetic attraction"
This book takes a chronological approach to exploring various experiences of girls and women towards and throughout comp sci studies, but it lacks any depth on how women encounter the field/industry/practice of software development and the greater world of computing post-graduation. As someone deeply embedded in the world of software development in a business/corporate setting, I have fewer opportunities to influence nascent techie girls & women in academic settings - far more direct and indirect influence over those engaged in software and tech professionally. While of course already dated in terms of technology, this book speaks SO MUCH to my experience as a woman in computer science. I keep finding myself shouting "Yes! That's exactly what it's like!" The authors really get to the heart of this issue. I was lucky enough to have a computer at home at a very young age and then go to a relatively small, liberal arts college, which meant I didn't have to deal QUITE so much with the competitive edge that the Carnegie Mellon students describe, but it was While of course already dated in terms of technology, this book speaks SO MUCH to my experience as a woman in computer science. I keep finding myself shouting "Yes! That's exactly what it's like!" The authors really get to the heart of this issue. I was lucky enough to have a computer at home at a very young age and then go to a relatively small, liberal arts college, which meant I didn't have to deal QUITE so much with the competitive edge that the Carnegie Mellon students describe, but it was still a difficult field to be in. I remember my first few weeks, when I had to, ashamed, ask my fellow students for help with the Solaris machines - the likes of which I'd never encountered before. It probably didn't help that while I had written code when I was 7 and was clearly comfortable with computers, my high school wouldn't allow me to skip our intro computer science class - which taught us how to use Paint and spreadsheets; our "create a webpage" assignment was simply a DRAWING of the site, with no code behind it!!!! Luckily, my teacher recognized that I was well beyond that, and let me do some extra credit BASIC programming while I waited for the other students to finish their work. I went to college intending to major either in Computer Science or English. I didn't choose CS for the potential monetary gain; I still find it amusing that when I would originally tell people I was interested in programming, they'd say, "Oh! You'll be rolling in the money!" Of course, by the time I graduated college, that wasn't quite the case anyway, but that wasn't what I went into it for. I loved the logic, the organization, the ability to make a machine do what you wanted (and by the same token, knowing the machine would do ONLY what you asked, nothing more or less). So I was lucky enough to go to a school with a VERY small (and close-knit) CS department, and a department chair who was a woman. I was lucky enough to be one of the two top-scoring students on the CS101 final for all the intro classes, which gave me the confidence I needed (it helped that we began with Lisp, which was a language MOST of the other students had never encountered). I was lucky enough to love writing code and staying up all night with my fellow students getting our programs to work - what a great feeling. And I was lucky enough to graduate with a degree, and get a job writing code. However, you might ask why I'm not a programmer anymore. I'm a librarian instead. What happened? Well, as the book outlines again and again, I spent 5 years in the CS field, but was constantly nagged by doubts. I was a woman in a man's world, unfortunately. One where I felt that the guys would always "know more" (even if this was just their confidence speaking, and not their actual knowledge). One where I didn't "dream in code" as the book mentions; I wanted more balance in my life than a lot of the geeky guys care for. And I wanted to do some good, make a positive change in the world. I was the only female programmer in my company when I was laid off in 2009. I was actually relieved to be laid off, because I had been looking for some time to move into another field - and I took the opportunity to go back to school and get my MLS. Now, I get to be in a field where I feel good about myself, and feel like I can make a difference in the world. I get to still write code occasionally, but it is NOT my only job. I get to use computers how I've always loved to. Don't get me wrong, I LOVE that I have had the experience of getting into the guts of a computer and writing in machine code. I wouldn't take back those experiences for the world. But I also love where I am, now - with the knowledge and background and ability, but also the chance to do so much more. This book was incredibly vindicating. It voiced all of the complaints I never knew how to articulate, assuaged doubts about my intelligence and ability to persevere, and was just generally what I needed to hear and read. I'm not sure it will be compelling enough for someone who thinks they see things "objectively" to change their minds, but sometimes nothing is enough. I thought this book did an excellent job of concisely combining qualitative and quantitative data from the authors' longitudinal This book was incredibly vindicating. It voiced all of the complaints I never knew how to articulate, assuaged doubts about my intelligence and ability to persevere, and was just generally what I needed to hear and read. I'm not sure it will be compelling enough for someone who thinks they see things "objectively" to change their minds, but sometimes nothing is enough. I thought this book did an excellent job of concisely combining qualitative and quantitative data from the authors' longitudinal study as well as articles and books from 20+ years of research on the subjects of women and computing. Excellent book; a must read for anyone who cares about getting more young women to choose Computer Science as a field of study and a profession, from grade school through grad school. I'm not remotely a computer scientist but I was able to recognize the experiences in the book by translating them to the form: "what happens when there is an individual or group who does not feel that they fit in or are valued in a particular culture?" The culture discussed in the book in the boy wonder / male hacker culture prevalent in computer science. Some of the more explicit forms of exclusivity and bullying from both students and teachers who feel themselves to be members of the group towa I'm not remotely a computer scientist but I was able to recognize the experiences in the book by translating them to the form: "what happens when there is an individual or group who does not feel that they fit in or are valued in a particular culture?" The culture discussed in the book in the boy wonder / male hacker culture prevalent in computer science. Some of the more explicit forms of exclusivity and bullying from both students and teachers who feel themselves to be members of the group towards those they feel are not part of this group are awful, but they easily explain why particular groups in the population do not end up experiencing the same opportunities to 'discover' whether or not they would be interested in computer science. A lot of this exclusivity happens early in life (e.g., putting the computer in the son's room rather than the daughter's room or common room), and continues in schools. What's harder to explain, and what I was particularly interested in, is what happens to students who don't fit into the dominant culture, yet one way or another managed to discover that they really were interested in computer science. They show up at colleges like Carnegie Mellon, places that for the large part no longer have explicitly rejecting/discriminating behaviors towards these students. Nonetheless, students who do not identify as strongly with the dominant male hacker culture (in this case, largely women) end up more prone to lose their confidence, and without recovery of confidence, to interpret this loss in confidence as a lack of ability and interest -- followed ultimately by leaving the field. This is the more frequent but not the only outcome. There are also "persisters," students who don't fit into the dominant culture, but nonetheless soldier on and even thrive. There were only a handful of perisisters chronicled in the book, and almost all had some extrinsic source of motivation to keep their feet to the fire and felt their was no option for failure (e.g., student whose family was depending on the money she would make after graduation to live on and help support younger siblings). The authors argue that these students stayed in the game long enough to have experiences that eventually did restore their confidence, and that if other students did the same, this would have happened to them as well. It's an argument for a "don't look down"/"exiting is not an option" mental strategy for individual persistence. I wish there were data to support this claim, as it is currently my own primary motivation for keeping one foot stepping in front of the other. It would be nice to have another example of the efficacy of total mental commitment to forward movement besides that of General Xiang Yu -- preferably one that involves someone with whom I feel I can identify, and does not end with that person falling on their own sword. I found this to be simultaneously a very important book and a rather dull book. I would have found the book fascinating 5 years ago. But now I have spent a summer at CMU interacting with their women@scs group; I have seen Jane Margolis speak twice (once with Allan Fisher); I have seen many other wonderful speakers talk about women in computing; I have given miniature versions of such talks myself. The material in this book has become such a part of my life, such a part of how I relate to my fiel I found this to be simultaneously a very important book and a rather dull book. I would have found the book fascinating 5 years ago. But now I have spent a summer at CMU interacting with their women@scs group; I have seen Jane Margolis speak twice (once with Allan Fisher); I have seen many other wonderful speakers talk about women in computing; I have given miniature versions of such talks myself. The material in this book has become such a part of my life, such a part of how I relate to my field of choice, that actually reading the material felt a little redundant. I owe this book a real review, but for now, let's leave it at this: everyone working in programming and computer science should probably read this. While the discussion of the attributes of women in technology is [necessarily] rather broad (and made me feel a little bit antisocial, in comparison), the characterization of our experiences is accurate. In my mind the description of the crippling doubt that women face, even when we are successful, is the crux of the book. If this research had been d I owe this book a real review, but for now, let's leave it at this: everyone working in programming and computer science should probably read this. As a girl in tech, reading this book helped me realize how hungry I was for something like that. I found the reflection of my own, long denied and well hidden emotions, and it helped me understand why I was against even talking about the problem of girls in tech. I was simply scared of digging out that pile of stinky skeletons! The interviews with a multitude of different Carnegie Mellon female students of the CS program made me feel at home, helped me maybe not to gain confidence, but to lessen As a girl in tech, reading this book helped me realize how hungry I was for something like that. I found the reflection of my own, long denied and well hidden emotions, and it helped me understand why I was against even talking about the problem of girls in tech. I was simply scared of digging out that pile of stinky skeletons! There's a stereotype of a hacker, someone who has been coding since childhood and spends their spare time working on computers. It's often easy to identify great programmers who fit this mold. And I identify with it myself, at least to some extent. This book made clear to me how narrow that stereotype is. There could be many ways to be successful in computing if we don't focus too much on that stereotype as the norm. By the time they reach college, girls probably avoid identifying as "myopically obsessive" geeks because they can't even imagine themselves as geeks or understand how a girl geek is even supposed to act or look. Nevermind the fact that neglecting to make love to C++ costs them precious, precious money and prestige in their careers. Am also present firmly in the nurture side of the debate and they didn't commit to one side. Well researched and insightful book on why we face a gender gap in the technology workforce. The question of why there are so few women involved in computing-related fields inspires much discussion, most of it heavy on anecdotes and speculation. I found this book in my search for studies that had approached the issue with more rigor. The core research underlying "Unlocking the Clubhouse" is a longitudinal study conducted with undergraduate students at the Carnegie Mellon School of Computer Science in the mid-to-late 1990s, with additional investigation into girls' experiences with compu The question of why there are so few women involved in computing-related fields inspires much discussion, most of it heavy on anecdotes and speculation. I found this book in my search for studies that had approached the issue with more rigor. The core research underlying "Unlocking the Clubhouse" is a longitudinal study conducted with undergraduate students at the Carnegie Mellon School of Computer Science in the mid-to-late 1990s, with additional investigation into girls' experiences with computing prior to college and into gender issues in high school advanced placement computer science classes. 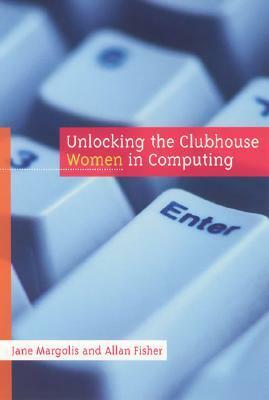 While "Unlocking the Clubhouse" is in some ways presented as drawing broad conclusions about the causes of the gender gap in computing, the exclusive focus on school-age years and academic computer science means that while it does an excellent job of answering the questions "Why do so few women pursue degrees in computer science?" and "What are the experiences of women in an elite academic CS program?" it arguably falls short of answering the more general question "Why are there so few women in computing?" Being one of those rare women myself (a software engineer, but without a CS degree) I would have appreciated some additional investigation into women's experiences in computing-related professions, as factors influencing women into and out of the field are not confined to the classroom. This book is about a study conducted at the Carnegie Mellon University School of Computer Science. The focus of the study was to determine why many women choose to leave the computer science program, and hope that these results generalize and determine why there are so few women in computer science (or, as I like to think of it, "Why am I surrounded by dudes?"). Although much of the data they use is based on interviews, the authors make a reasonable effort to avoid anecdotalism. Although not en This book is about a study conducted at the Carnegie Mellon University School of Computer Science. The focus of the study was to determine why many women choose to leave the computer science program, and hope that these results generalize and determine why there are so few women in computer science (or, as I like to think of it, "Why am I surrounded by dudes?"). Although much of the data they use is based on interviews, the authors make a reasonable effort to avoid anecdotalism. Although not entirely successful, it still seems like this phenomenon is worth measuring, and this way of measuring is probably better than guessing. In regards to what I learned, it never really occurred to me that women are intimidated by the sheer geekiness of some men (irregardless of any overt sexisim). Lack of confidence is still not something I understand very well. This book should be a pre-requisite to all books that talk about what it means to be a programmer. Our industry is plagued with reading material which reinforces narrowly focused and masculine ideals for the industry, and it's all too prevalent in any environment for someone who codes to be expected to live and breathe nothing but that. We need a broader and deeper view of what is going on in the world and how to write and contribute to applications that affect change. This book speaks Eye opening. This book speaks to more than that, through the study and interviews it helps to clarify the deeper systematic issues to contribute to a hostile and sometimes toxic industry. This happens not absentmindedly, but thoughtfully with suggestions, case studies, approaches and examples along the way. Good book about how Carnegie Mellon increased the fraction of women majoring in computer science--and kept retention rates high. A good long term project; it seemed they worked around the tenured and tenure-track faculty. One problem is that they assumed that women had one distribution of attributes, computer science at first demanded another set--and the idea was that they moved both distributions until they got higher overlap between the two distributions. (This is not quite true--they moved th Good book about how Carnegie Mellon increased the fraction of women majoring in computer science--and kept retention rates high. A good long term project; it seemed they worked around the tenured and tenure-track faculty. One problem is that they assumed that women had one distribution of attributes, computer science at first demanded another set--and the idea was that they moved both distributions until they got higher overlap between the two distributions. (This is not quite true--they moved the major away from the geeks, and developed a less competitive culture). They also did not really motivate why having more women in computer science addressed some greater good (other than more women in computer science would be great). For much of my education and early career, I thought that gender differences didn't affect me or people in my career. I changed my mind when I saw less competent but more confident people becoming more successful in my chosen field. Reading this book made me realize that some of my difficulties were gender related and that if I can tackle those, I can become more technically proficient and more successful in my career path. This is the best book I have ever read on how to improve the participation and acceptance of women in computer science. Drs. Fisher and Margolis significantly improved the percentage of undergraduate women at Carnegie Mellon University and wrote this book to say how they did it. I have bought at least five copies to give away with my strongest recommendation. Offered some really great insight into how gender mediates access to technology. Moreover it cited some really great research about how gender mediates education in general. The book seemed a little light on solutions, however. A great review of what it is like to be a woman in computing. This book was quite interesting, but I only got a little way into it before it had to be returned to the library. I will try to get back to it at some point. Wow wow wow!! So good. Chapter 4 spoke volumes to me. Fascinating read. It was written 15 years ago (so of course is horribly outdated) but I'd say it's a must-read for anyone who cares, or doesn't care, about gender in computing. This book reports on a study done at Carnegie Mellon University regarding factors contributing to low percentage of women in computer science programs.